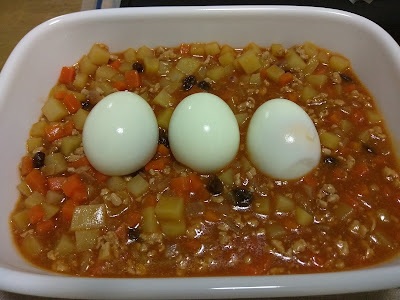 Received some requests when I posted about the menudillo and egg I prepared for dinner yesterday. It's quite easy to cook and inexpensive too! 1. Boil the eggs. Peel and then set aside. 2. On a pot saute garlic and onion. Once soft add the ground pork and saute. 3. Once pork is cooked add the potatoes and carrot. Mix and then add 1 cup of water. 4. Let the water boil and simmer until the potatoes and carrots are cooked. 5. Add the tomato sauce. Mix well and then add the raisins. 7. Once it's yummy put it in a bowl and arrange the eggs on the meat mixture. Serve with rice. Quite inexpensive to prepare and looks like a meal for someone who's on a workout routine. The meal is not really physically appealing though haha.